It’s been a long time since my last spawn. Everything was just getting too much for a while there. Quite a while. More than three years. It’s good to be back. The parents of this spawn were bred by Shane and Joel of Betta Spectra. I’m told to expect a lolly bag. Pair introduced very late at night on Wednesday 17/10/2018 after only about 3-4 days conditioning. Didn’t use a chimney they were in adjacent tanks and I simply uncarded them. They were put together before I went to bed and the lights turned off. It had been raining for a couple of days and the moon was waxing (1st quarter). Not sure exactly when they spawned. I only noticed the eggs on Friday night and there were tails on Saturday. Made a little YouTube to celebrate hahaha. The moon was in its first quarter, not second. In that case we should keep track of how easily this line spawns. We might be able to transfer that trait. They are free swimming already! And of course I’m not ready to feed them. Why would I be? I’ve only given that advice a few hundred times. 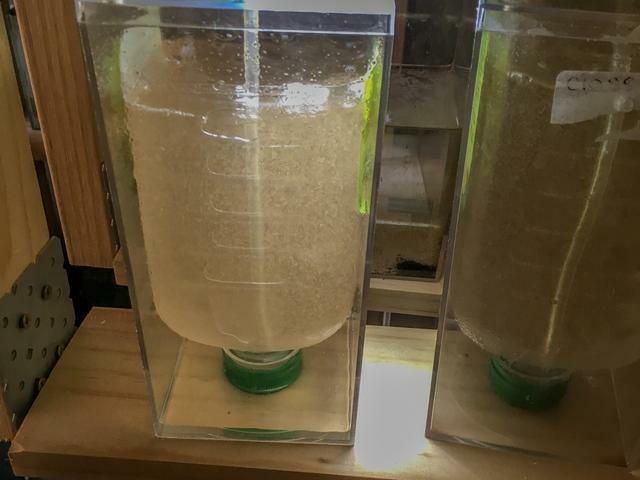 Had to rush around searching for air pump, airline, connectors, so that I could get a rough brine shrimp hatchery going. How did you go with the hatchery? Fry doing well? Hatchery is going well. Will take some pictures. 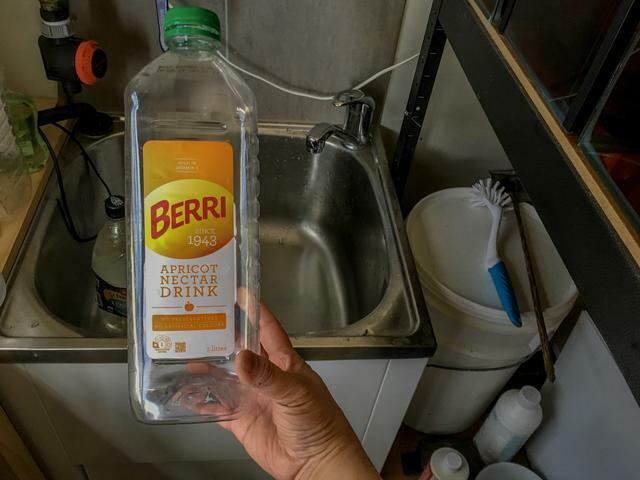 So my quick and cheap diy brine shrimp hatcher consists of an upside down Berri juice bottle sliced to the right length and an airline coming in from above and resting in the cap. I discovered that it fits nicely in a beanie box which is what I’m using to hold the bottles upright and I’m also using the beanie box lid to control the splashes. Great little setup! And thanks for reminding me to set up my hatcheries! The fry numbers seem to have dropped a lot. I didn’t have as much plant matter as I usually do so I think there simply weren’t enough micro organisms for them. And I think I might be overfeeding with bbs and need to do more water changes. I feel I’m being so clumsy with this spawn. I really wasn’t quite ready for it. But the fish were ready so whatcha gonna do, eh? I seem to have a few swim bladder issues among the larger fry. And there is a huge range of sizes. I’ve been adding green water occasionally to help the smaller ones. I forgot to log when I moved them from the unfiltered 8 litre spawn tank to a 10 litre with sponge filter. Not that it’s a huge difference. I’ve been doing water changes twice a day. In the morning before work and when I get home. That’s also when I feed them. I’m going to move them into a 2 foot tank in the next few days. AND I still don’t have pics of the parents or the fry!